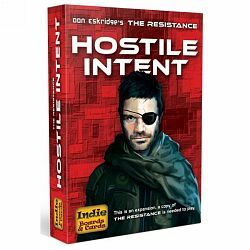 Hostile Intent is an expansion to The Resistance consisting of three modules. Hunter Module: The battle between resistance and imperial has become more intense. It is no longer enough to target facilities in missions - the target has become personal as both sides look to neutralize their opponent's leaders. In this module both the resistance and spies must identify a specific individual among the opposing team to win. Hunters introduces many new game concepts that bring a whole new level of deduction and deceit into The Resistance. Reverser Module: Reversers have the ability to change the results of any mission – in the hands of the resistance this can make a doomed mission succeed, or turn certain victory into defeat. A very interesting and potentially chaotic twist that is certain to change your meta game forever. Inquisitor Module: The Inquisitor is an optional player ability first seen in Avalon. The player with the Inquisitor will be able to look at the affiliation of another player and is a simple way to ensure every game is full of interest twists and turns as the Inquisitor uncovers the truth (at least their version of the truth).